Sculpture commemorates the resting place of a female member of the Birriguba tribe believed to be between 500 and 1000 years old. It is also in memory of those who traditionally occupied the land before the arrival of Europeans. 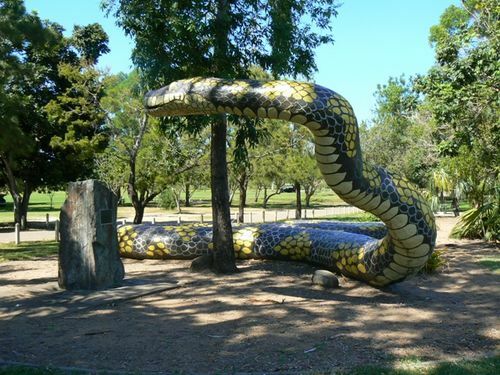 The memorial contains a sculpture of the Rainbow Serpent as well as a series of plaques. Additional remains have been re-interred at the site since the memorial unveiling in 1987. The skeleton, buried between 500 and 1000 years ago was discovered by a fourth year archaeology student, Michele Bird, when it was exposed by the drifting sand dunes. As parts of this skeleton had already been kicked away by travellers across the dunes, the skeleton was removed for safe-keeping when it was discovered in January 1987. The young woman, buried in the traditional flexed position was between 17 and 25 years old, had a good balanced but somewhat gritty diet (as could be detected from the lack of tooth decay but the wearing down of the molars or cheek teeth). The Burdekin Shire Council, on the initiative of Associate Professor John Campbell of James Cook University, decided to rebury the skeleton as part of a memorial to the people who traditionally occupied the land. The two oldest surviving elders of the Birriguba tribe attended the unveiling of the memorial in June 1987. THIS COMMEMORATES THE RESTING PLACE OF A MEMBER OF THE BIRRIGUBA TRIBE, AND STANDS IN MEMORY OF THE PEOPLE WHO TRADITIONALLY OCCUPIED THIS LAND BEFORE THE EUROPEANS CAME. SCIENTIFIC EVIDENCE SUGGESTS THAT ABORIGINAL PEOPLE HAVE LIVED IN THIS COUNTRY FOR OVER 40,000 YEARS. THIS MEMORIAL WAS ERECTED BY THEIR LIVING DESCENDANTS WITH THE SUPPORT OF THE BURDEKIN SHIRE COUNCIL AND THE ARCHAELOGY BRANCH OF THE DEPARTMENT OF COMMUNITY SERVICES. Plaque 2: Here lies the remains of a Birriguba - Juru aboriginal adult found at Salty Gully. The remains are pre-european, this means that death occurred before 1788. Re-interred on 13th October 2002 by Birriguba - Juru descendants. Gubulla Munda is the totem for the Juru Tribe of the Birri-Gubba nation. Gubulla Munda holds sacred, cultural and spiritual significance to the traditional owners. Gubulla Munda Dreaming comes from higher powers of Mother Earth. Gubulla Munda travelled through the waters, up to the dry land and rested, the perspiration of Gubulla Munda formed the hills, mountains, rivers and streams. Gubulla Munda travelled back down to the water and rested. As Gubulla Munda moved through the waters, the droppings formed the islands. This is our sacred story of Gubulla Munda Dreaming.